Iran and its Lebanese proxy are big winners from the Palestinian reconciliation accord signed by the rival Hamas-Fatah factions in Cairo on Thursday, Oct. 12 in Cairo. It was Hamas’ chief of terrorist operations against Israel, Saleh Arouri, who signed the agreement for his party. He postponed his return to the luxury appartment Hizballah made available for him in the Shiite Dahya suburb of Beirut to stay for another week to discuss points that are still outstanding. The Palestinian unity deal can typically be divided into the public version designed for popular consumption and the secret text which is the more realistic. All the parties to the deal connived in this presentation to blur over the contradiction between the published agreement and its inevitably dysfunctional implementation. From the outset, Palestinian Authority leader Mahmoud Abbas hailed the accord as “the end of the rift,” even though his representative Ahmed Azzam was secretly prevented from leaving for home in Ramallah – or even his Cairo hotel – until he signed it. US officials contented themselves by expressing the hope that the deal would ease Gaza’s humanitarian crisis, without further comment. And sources in Jerusalem said they had nothing to say until Hamas recognizes the State of Israel and disbands its military wing – a totally unrealistic approach most likely to achieve the reverse effect. Both American and Israel made not the slightest protest against a branded master terrorist signing the reconciliation accord between the rival Palestinian factions. So what was the point of the US offering a bounty of $12 million for information leading to the capture of two leading Hizballah terrorists Talat Hamiyah and Fouad Shukr? Saleh Arouri, who lives in the posh Hizballah-ruled Beirut neighborhood, most likely sees them regularly to discuss coordination between the Hizballah and Hamas terror networks. So into whose hands will the heavy weapons and warplanes Washington supplied to the Lebanese army “to fight ISIS,” fall, when it is an open secret that Hizballah rules the Lebanese military. Even Israel’s Defense Minister Avigdor Lieberman had to admit this week – although unwillingly – that the Lebanese army was no better than a wing of Hizballah and totally under its thumb. US and Israeli assent to the “lebanizaton” of the Gaza Strip is best explained as the outcome of their failure to keep Syria from being taken over by Iran and its Lebanese stooge. 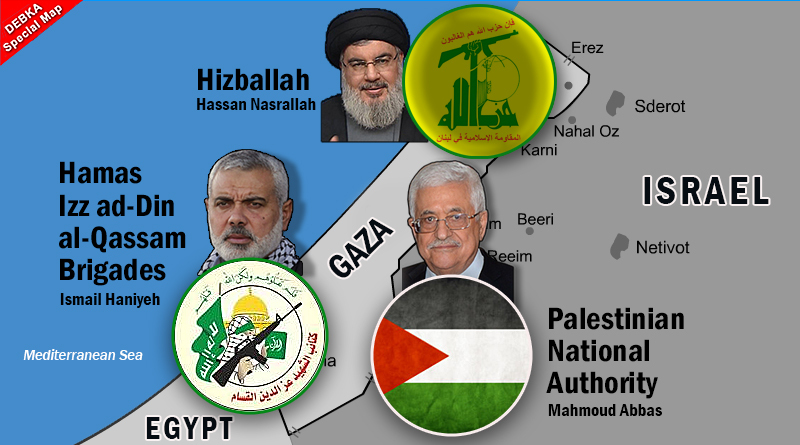 As for the Gaza Strip, while the Palestinian Authority is committed to deploying 3,000 security personnel to the enclave’s borders and crossings, Hamas is keeping intact its 20,000-strong military arm, Ezz e-din Al-Qassam, which can overwhelm the incomers from Ramallah at any moment. But, most importantly, the PA is cast in teh role of providing the Hamas terrorist force with a line of defense against Israel. In South Lebanon, too, the Lebanese army and UNIFIL stand as buffers for protecting Hizballah strongholds against the Israeli army. Excuse me, this is GREAT!!! whine, whine, whine…..moan, moan……STOP FCUKING WHINING ! !